This collection of essays provides a historical and contemporary context for Indigenous new media arts practice in Canada. The writers are established artists, scholars, and curators who cover thematic concepts and underlying approaches to new media from a distinctly Indigenous perspective. 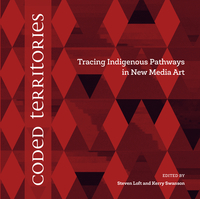 Through discourse and narrative analysis, the writers discuss a number of topics ranging from how Indigenous worldviews inform unique approaches to new media arts practice to their own work and specific contemporary works. Contributors include: Archer Pechawis, Jackson 2Bears, Jason Edward Lewis, Steven Foster, Candice Hopkins, and Cheryl L'Hirondelle. The book is available at the ImagineNATIVE Film and Media Arts Festival: www.imaginenative.org. 5: If History Moves at the Speed of Its Weapons . . .